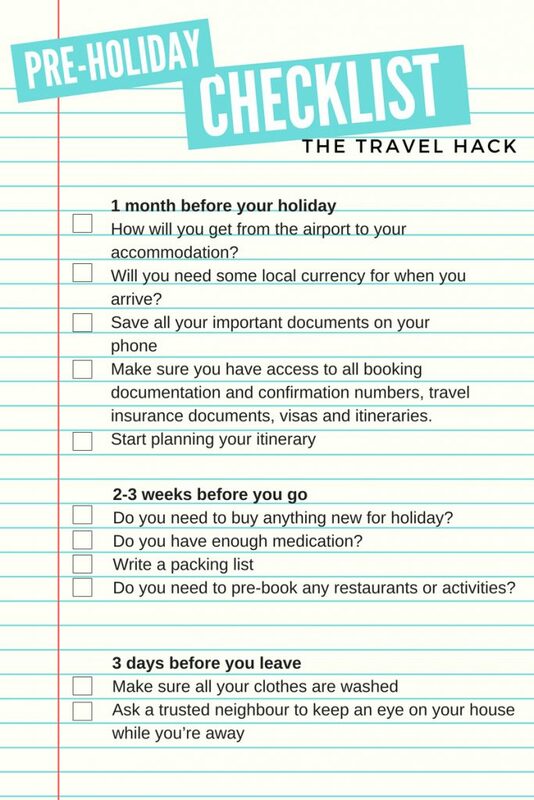 Here’s my downloadable pre-holiday checklist to help you stay organised while booking and organising your holiday. Holidays are one of the most exciting times of the year. We book them months in advance and then spend weeks planning them while the excited flutter in your belly builds until you’re pinging off the walls with excitement. I travel a lot, but I still get this excited energy before every trip! But one thing we don’t talk about is the pre-holiday stress many of us also feel. Before every holiday, whether it’s a weekend away or a 12-month adventure around the world, there’s always a small element of pre-holiday stress. There’s a lot to organise and plan before a holiday and, as you get older and have more ‘stuff’ and more responsibilities, there’s even more to organise! 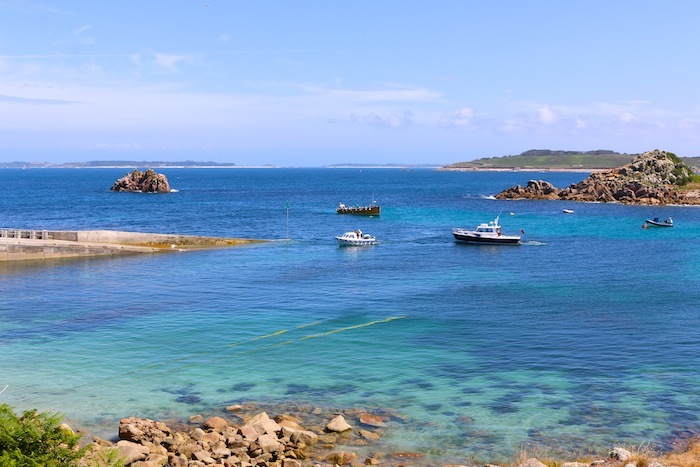 So I’ve created this pre-holiday check-list so you tick the boxes as you organise and book every element of your holiday. I’m naturally a very scatty, disorganised person. This comes as no surprise to people who know me, but those who read this blog might not realise! Apparently creative people are always disorganised and messy so I’m going to hold on to that thought! Because I’m so disorganised I really have to go out of my way to feel any semblance of organisation in my life, so I often come across as being crazy organised. I have lists for everything and I check things off as I go. This is my pre-holiday checklist with everything I need to do to organise a holiday. It includes everything I do from just before booking to arriving at the airport. You can download this pre-holiday checklist here. Are your passports in date? Can you get time off work? Can someone look after your pet(s)? Can you get to the airport at that time? That cheap 6am flight might seem like a good idea but if there’s no public transport to get to the airport at 3am then you may need to take a taxi which could be more expensive than the 10am flight. Can you give the hotel a call and get a room upgrade/breakfast included? Will the weather be OK during your visit? Will there be any major events on while you visit? This might be a reason for your trip but if you’d rather avoid the crowds then check there’s not a big sporting event or festival happening over your travel dates. If you do, how long will it take to get it and will you definitely be accepted? Travel Hack Tip: If you’re booking everything for your holiday online, create an email folder for all of your booking confirmation emails, receipts and other holiday-related emails. It’s so much easier to have everything in one place, especially if you’re booking this holiday months in advance and emails might get lost before you leave. I have annual travel insurance with Admiral –Annual policies are really useful to have so you’ll never forget to sort out travel insurance. How are you getting to the airport? Do you need to book airport parking? What are the luggage requirements for your flight? Will you need to buy/borrow luggage for the trip? Do you need a hire car for when you arrive? Are there any activities you need to book in advance? How will you get from the airport to your accommodation? Will you need some local currency for when you arrive? Make sure you have access to all booking documentation and confirmation numbers, travel insurance documents, visas and itineraries. I usually email them to myself and then take a screenshot so I have offline access to them. Do you need to buy anything new for holiday? Do you have enough medication? Do you need to pre-book any restaurants or activities? Pack your hand luggage and make sure all liquids are under 100ml and you don’t have anything in there you shouldn’t! Do you need to buy any snacks for the plane? Is your heating on the right settings? Have you got your passport, purse/wallet, mobile phone and charger? Realistically, these are the only four things you really need so when I feel like I’ve forgotten something I reassure myself I got the essentials! Check your luggage in, get yourself through security, grab yourself a drink and relax. Ahhhh, you’re going on holiday! That’s the stressful part of a holiday over and done with and, if you’ve done everything on the pre-holiday checklist above, you’ll have nothing to worry about and you’re ready for a stress-free holiday. Do you have a pre-holiday check-list? If you do, what’s on your list? 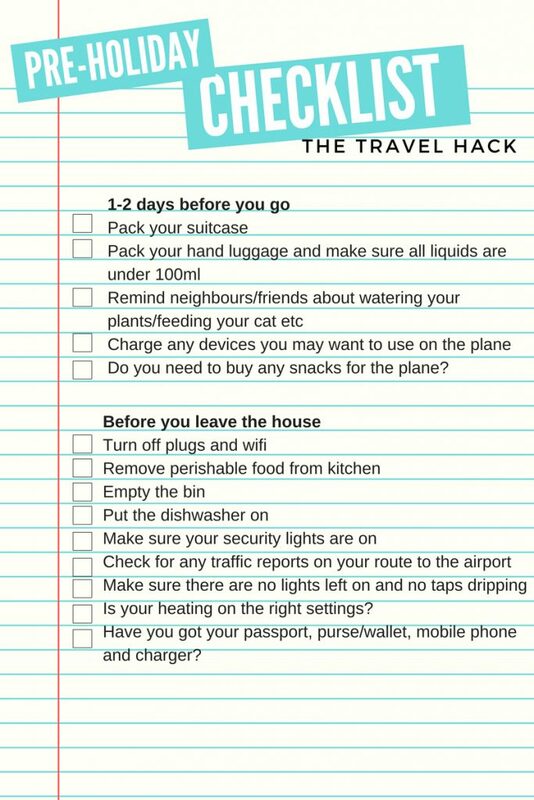 You can download and print my Pre-Holiday Checklist by The Travel Hack! As ever really useful info. On the medication front – check that you are allowed to take it into the country/countries you’re visiting.